This Gravity Queen Platform Bed in Ebony Black finish is great value for your money, as it does not require a box spring. In addition, the decorative legs will give your bedroom a stylish touch. It can be combined with all South Shores collections available in Ebony finish. It is designed to support a maximum weight of 500 pounds. It is also available in Pure Black, Pure White or Chocolate finish. It measures 82-1/2-inch long by 63-1/2-inch wide by 13-1/2-inch high. It is delivered in a box measuring 87-3/4-inch by 14-inch by 7-inch and weighing 130 pounds. Pair it with the rest of the Gravity collection to complete your bedroom set. Mattress and accessories not included. Manufactured from certified Environmentally Preferred laminated particle panels. Complete assembly required by 2 adults. Tools are not included. 5-year limited warranty. Made in Canada. it does not require a box spring. It is designed to support a maximum weight of 500 pounds. The sturdy Fynn full platform bed clean design in trendy Gray Oak finish makes any bedroom look fabulous. Its legs add a touch of refinement to your decor, and its versatile look ensures it will elegantly match any furniture with the same finish. Its weight capacity is 500 pounds and no box spring is required. Mattress and accessories not included. It measures 78-1/4-inch wide by 58-1/4-inch deep by 13-1/2-inch high. It is delivered in a box measuring 78-1/2-inch by 23-inch by 6-inch and weighing 121 pounds. Manufactured from certified Environmentally Preferred laminated particle panels. Complete assembly required by 2 adults. Tools are not included. 5-year limited warranty. Made in Canada. Gravity Collection Queen Platform Bed (60'') Ebony This Gravity Queen Platform Bed in Ebony Black finish is great value for your money, as it does not require a box spring. In addition, the decorative legs will give your bedroom a stylish touch. It can be combined with all South Shores collections available in Ebony finish. It is designed to support a maximum weight of 500 pounds. It is also available in Pure Black, Pure White or Chocolate finish. It measures 82-1/2-inch long by 63-1/2-inch wide by 13-1/2-inch high. It is delivered in a box measuring 87-3/4-inch by 14-inch by 7-inch and weighing 130 pounds. Pair it with the rest of the Gravity collection to complete your bedroom set. Mattress and accessories not included. Manufactured from certified Environmentally Preferred laminated particle panels. Complete assembly required by 2 adults. Tools are not included. 5-year limited warranty. Made in Canada. 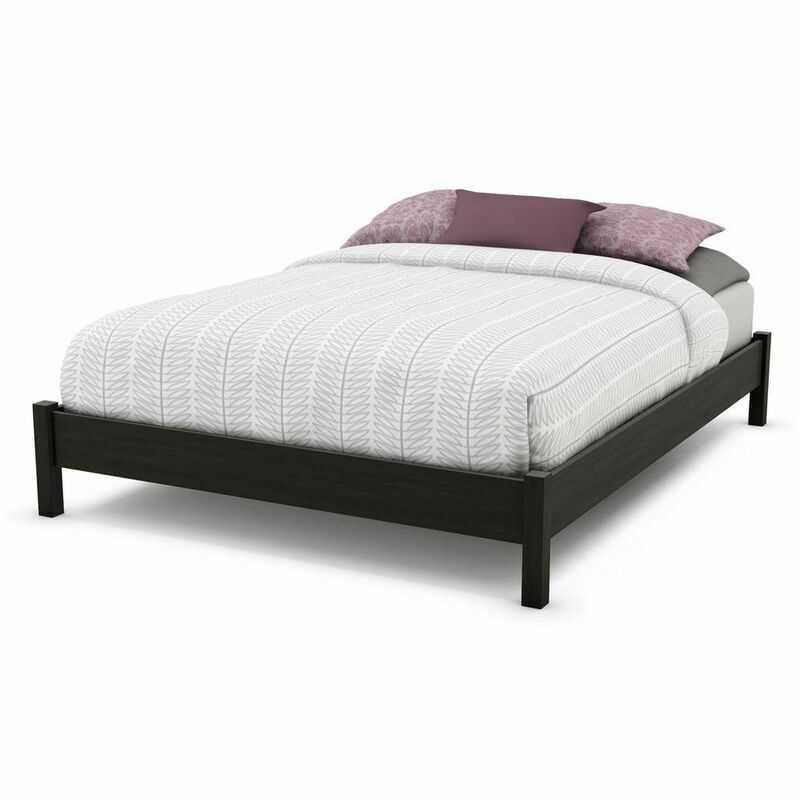 Gravity Collection Queen Platform Bed (60'') Ebony is rated 1.0 out of 5 by 3. Rated 1 out of 5 by Ticey from After a couple of weeks of use, the support structure (particle board) broke. After a couple of weeks of use, the support structure (particle board) broke. Rated 1 out of 5 by nickname2 from Poor Quality The screws split in half and the wooden frame in middle of bed split after 6 weeks. Rated 1 out of 5 by Sm422 from Terrible Fell apart on me in a matter of months. It comes in 100 little pieces and is made of particle board. Worst purchase ever.